wow, finally i found this one ! every german scener calling pcb systems back in the time should remember this. 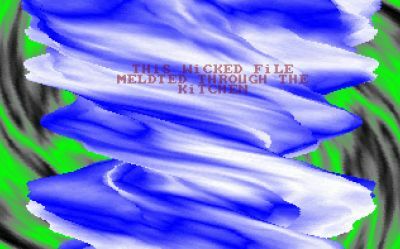 kitchen bbs was one of the fastest, and nearly in every file you leeched, you had this thingie. heh, damn i can't run this one here. is this the version were my tune is included or is it the other one? updated with working link and new screenshot. yaay for one of my favorite bbstroes! Nice one, nowadays way to fast on modern computers. @Dalezy: No sound in this one. Liked it, looked at the source back in '98 to see how this twisty was done. nice and colourful 8k bbstro.